New! From GriefShare - A much needed DVD curriculum that is an outreach and care ministry combined. As you know, the death of a spouse brings a unique kind of pain. People who are widowed haven’t just lost a loved one—they’ve lost an entire lifestyle. That’s why we’ve developed Loss of a Spouse. For churches that offer GriefShare in their ministry know the pain that a person faces when they have lost their spouse and the many secondary losses that accompany the death. This new easy-to-use, stand-alone two-hour GriefShare seminar is the perfect companion to your GriefShare ministry. 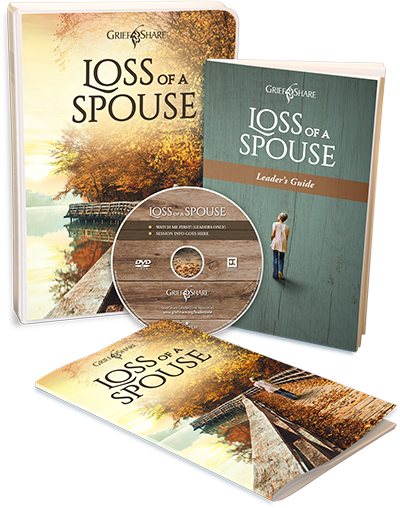 For churches who do not use the GriefShare series this is a tool to reach the grieving spouse in your community and minister to their specific needs. Loss of a Spouse draws new people to your church and GriefShare ministry by offering support to grieving spouses. Our two-fhour seminar works just like a typical GriefShare meeting or a Surviving the Holidays event, with a short video followed by small-group discussion. The video features expert Christian counselors, authors, and pastors, including new interviews with some of your favorites from the GriefShare curriculum. Notice: The GriefShare curriculum is designed for ministry sponsored and offered by local churches. These materials are only available for purchase by churches.